Now that two of the top three candidates for the Republican nomination have pulled out of the race, the big winner is the one candidate left standing: Mitt Romney. The polling before Huckabee and Trump pulled out was — in my survey — Romney-22, Huckabee-20, Trump-15, Gingrich-11, Palin-9, Bachmann-6, Pawlenty-3, and Daniels-2. Now, Romney will inherit a large proportion of the votes left on the table by Huckabee’s and Trump’s withdrawal. My polling suggests that, based on the expressed second choices of the Huckabee and Trump voters, Romney will get 30% of Huckabee’s voters and 40% of Trump’s. These additions should lift him over 30% of the vote and give him a 2:1 lead over the nearest contender (Gingrich). Romney was having a terrible week. His speech on health care was terrible. With Massachusetts up in arms over Romney-care and Republicans dead set against the individual and employer mandate, his failure to repudiate his program would have cost him dearly. But now he is sitting on top of the world. Republicans are a legitimist group. Having run before and paid his dues since, Romney is broadly attractive. He is seen as most likely to handle the economy successfully and most likely to defeat Obama. He new has the decided edge. Gingrich, Bachmann, Daniels, and Pawlenty are the obvious other beneficiaries of the shifting cast of characters. For Newt, the key is the debates that begin on June 7. 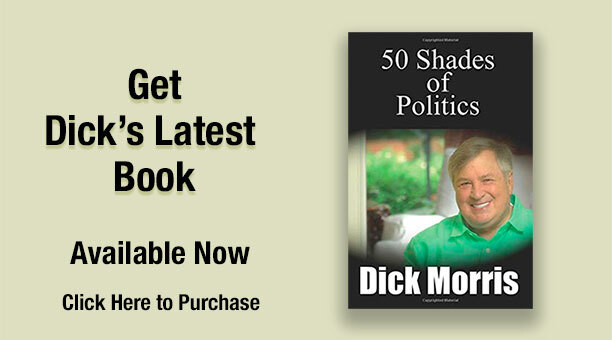 (Tune into on to dickmorris.com for my play-by-play commentary — in writing — on the debate as it unfolds and for my video commentary on it as soon as it is over). If Newt can establish that his intellectual and rhetorical prowess can overcome his personal negatives, he could be on his way to a strong run at the nomination. But perhaps they won’t be enough. We’ll see. For Bachmann, the key is to announce right away, first to keep Palin out of the race (Huckabee’s withdrawal will encourage her to run) and to lay claim to the evangelicals and Tea Party folks who would have backed Mike. Recent polling shows that the evangelicals and the Tea Party supporters are substantially the same people. They would be the base of a Bachmann candidacy and Michele needs to go out and claim them. For Daniels, the withdrawal of Trump opens the way for him to become the main establishment business community rival to Romney. And Huckabee’s withdrawal opens the door for conservatives to support him as well. He needs also to announce soon to get into the fray. For Pawlenty, the withdrawals may open the way into the race. With candidates as formidable as Trump and Huckabee sitting on their vote shares, there was little the former Minnesota Governor could do to get a word in edgewise. Now the way is open for him to get into the fray. But the big, big winner is Romney. It is now a rebuttable presumption that Romney will likely be the nominee. And that’s huge.